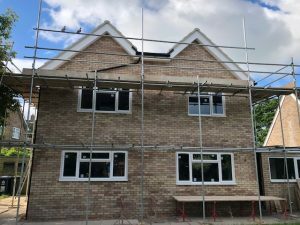 Along with working with the national housebuilding sector, the estimating and design team at Robinson Manufacturing love the variation and challenges that working with local builders and developers provide – like this twin ridge elevation. A recent project for Du Toit Building Services through Direct 2 Site presented just that sort of challenge. 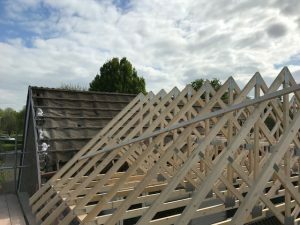 As the planned 2-storey extension was being added to a chalet bungalow roof, this meant that the height of the new roof had to be restricted to just 2200mm. 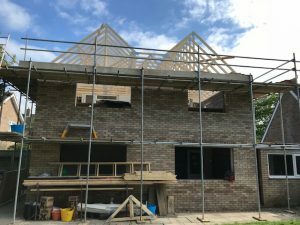 Not normally an issue, but with the span of the extension, this would have meant that the pitch would have fallen below that possible with a tiled roof. 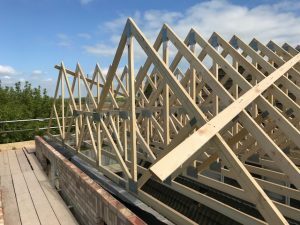 Du Toit Building created a twin ridge elevation to create the required pitches whilst also keeping clear of the main roof ridge height. 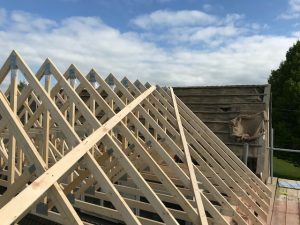 A site visit and measure by Robinson manufacturing confirmed the site details and how the new roof would tie in with the existing roof, something to add a bit of peace of mind when the trusses arrive! 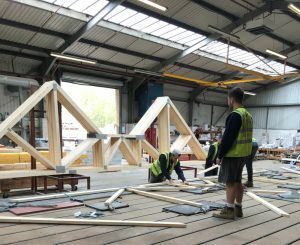 The end result was a clear spanning truss of 8000m, with a dropped section in the middle to create the twin ridges.